If you're somebody who likes to sing in the shower or in the car, or has a tune in your head for much of the day, we'd like to encourage you to consider joining our church choir. You don't need a solo voice, but if you think you'd enjoy singing, we'd love for you to give the choir experience a try. We like to think we have a close-knit group, almost like family, within the choir. We practice at 9:00 every Sunday morning, during the fall, winter and early spring months. One of the highlights of our year is the annual Palm Sunday multi-choir performance in Adel which brings together church choirs from throughout Dallas County. 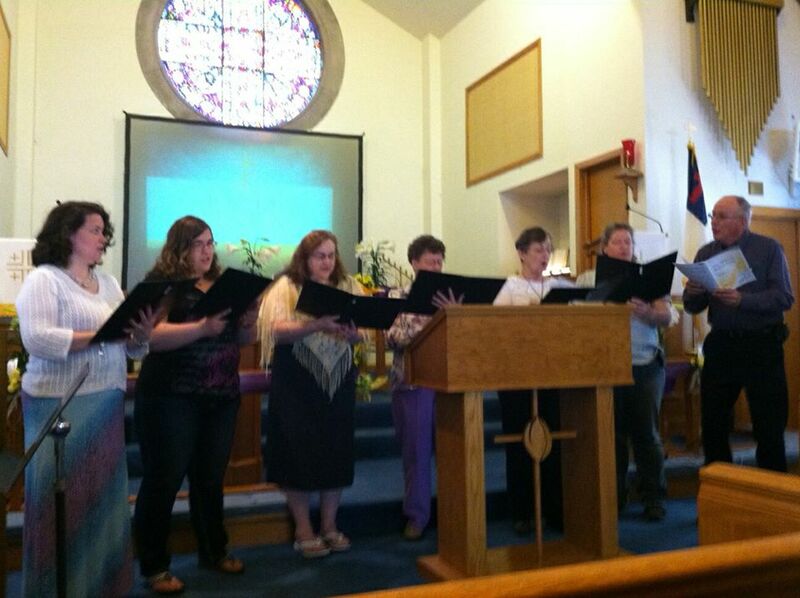 Singing in choir is a great way to praise God and enhance the worship service for others! If you have questions, call Harold Hill at 677-2389 or talk to one of the choir members. In 1943 an Adult Sunday School class was founded and, except a few blizzards, has met continuously since. The group meets each Sunday at 10:00 am in the sanctuary overflow room. A variety of materials is used to delve into the Bible. The Children's Sunday School class also meets at 10:00 am on Sunday mornings during the school year. Children in pre-K thru 5th grade learn their Bible stories through play, song, recitation and art. Meeting once a month, this group is open to all Middle and High School girls in the Minburn community. The group usually meets on the third Sunday afternoon in the Fellowship Hall. Contact the church for more information. Youth from Minburn join youth from a variety of churches in Adel and Desoto for an Ecumenical Vacation Bible School. Generally held the last week of June, the theme varies each year. Children who were at least 4 years-old on January 1 and who have just finished 5th grade are invited to attend. Older youth and adults from Minburn UMC volunteer their time as helpers and leaders. All kids age 4 years old through 5th grade are invited to attend. Wednesday Club is held each Wednesday, starting at 5:45 pm with a free evening meal followed by crafts, music and lessons and ends at 7:15 pm. Each year the children present a Christmas program and participate in a mission project. In the fall of 2015 the children collected over 1,000 pencils for their mission project! Please contact the office at 515-677-2254 for session start and end dates. Women from throughout the Minburn area meet for fellowship, support and education through the study of the Bible. The group meets on Sunday afternoons at 4:00 pm. Please contact the church office at 515-677-2254 for session dates and current study. Although not an official part of the MUMC, the church is proud to be the home of the Heartland Warriors 4-H Club. The club hosts its monthly meetings at the church as well as special events. Please contact the Dallas County Extension Office at 515-993-4281 for more information.